I am a planner by nature. Definitely a Type A. I like to have things planned out in advance, I like to know what's coming-in life, school, family, everything. So, it might surprise someone to find out that even with that personality, I haven't been planning for our homeschool. In years past, we did a very light preschool approach at home, and I always over planned. I eventually found out that it was a huge waste of my time, AND ended up stressing me out because we never stayed on track. I wasted so much time and resources printing, planning, and getting things ready, only for us to either skip certain things, or never even get around to those weeks. 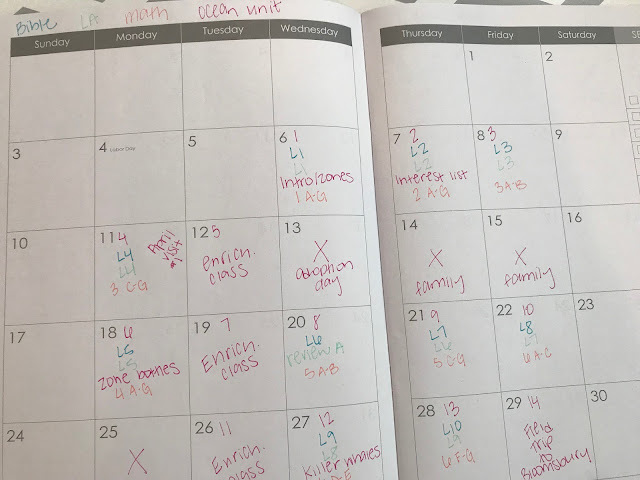 I see so many homeschooling moms who take time in the summer to plan out their entire school year at once. I always thought that would be me. It seems so appealing to have an entire years worth of plans laid out! But I eventually considered our lifestyle and every day things going on and realized that would never work for us, at least not right now. Sick days come up. Service days come up. Vacation happens. Field trips happen. Anytime we would take a day off it would set back the entire year of plans and that would drive me insane. I would feel like we either need to make up that school day (when? On a weekend or evening?? Double school one day?) or my calendar would just be off and that would drive my Type A crazy. So, I decided to try just not planning for this year. And it is working fabulously!!! Every day when we get done with school, I take a peek at the lessons for the following day and see what I need to get ready and that's it! After we are done for the day, I write down what lessons we did in a calendar, just to keep track of how many days of school and what we did. We don't actually need to do that for our state, we have really lax homeschooling laws here, but I just do it for my peace of mind. This way, if we ever need to take a day off randomly (like we did Monday, because a couple of us weren't feeling well), it doesn't set us back at all. I just pick back up the next day where we left off and do those lessons. I never thought this would work for me because I am such a planner, but I feel so much freedom for school now and love that we are making our way through each of the subjects at our pace. If my kids need extra time to learn a math concept, we can take it without feeling like we're setting the rest of the month back. Sweet freedom! For our ocean unit, or other supplemental activities or things, I do sometimes have ideas going on things I want to do with the kids. Sometimes I'll pin it to save for later, or just keep a running list of random activities I want to add in. This way, I have things ready to go, and in that way I plan a bit, but it doesn't mess anything up if we don't get to it. If you are a homeschooling mom, how do you plan? The whole year at once? A week at a time? A month at a time? Not at all?